While the perspective version looks great, there remains one problem. Move the time around until the rotating grey sphere ducks underneath the ground. Hmm. 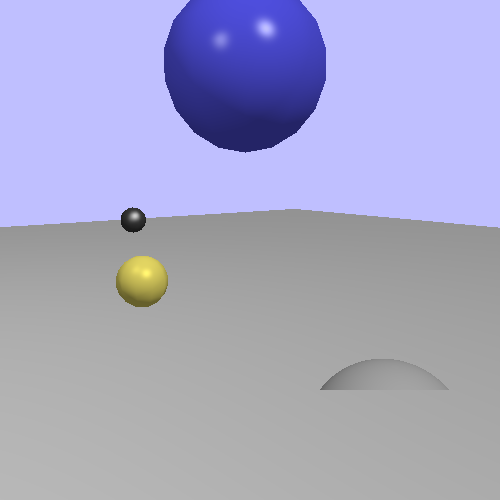 Even though we've made it look like a mathematically perfect sphere, it does not act like one to the depth buffer. As far as it is concerned, it's just a circle (remember: discard prevents depth writes and tests as well). Is that the end for our impostors? Hardly. Part of the fragment shader's output is a depth value. If you do not write one, then OpenGL will happily use gl_FragCoord.z as the depth output from the fragment shader. This value will be depth tested against the current depth value and, if the test passes, written to the depth buffer. But we do have the ability to write a depth value ourselves. To see how this is done, load up the tutorial (using the same code again) and press the H key. This will cause all impostors to use depth-correct shaders. //Set the depth based on the new cameraPos. Basically, we go through the process OpenGL normally goes through to compute the depth. 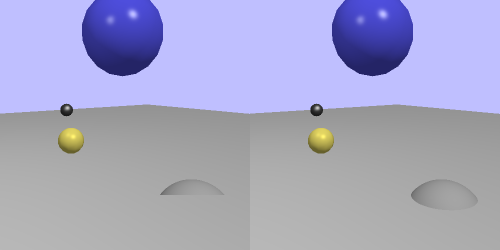 We just do it on the camera-space position we computed with the ray tracing function. The position is transformed to clip space. The perspective division happens, transforming to normalized device coordinate (NDC) space. The depth range function is applied, forcing the [-1, 1] range in the fragment shader to the range that the user provided with glDepthRange. We write the final depth to a built-in output variable gl_FragDepth. This is, in terms of behavior a noop; it does nothing OpenGL would not have done itself. However, in terms of performance, this is a drastic change. The reason fragment shaders are not required to have this line in all of them is to allow for certain optimizations. If the OpenGL driver can see that you do not set gl_FragDepth anywhere in the fragment shader, then it can dramatically improve performance in certain cases. If the driver knows that the output fragment depth is the same as the generated one, it can do the whole depth test before executing the fragment shader. This is called early depth test or early-z. This means that it can discard fragments before wasting precious time executing potentially complex fragment shaders. Indeed, most hardware nowadays has complicated early z culling hardware that can discard multiple fragments with a single test. The moment your fragment shader writes anything to gl_FragDepth, all of those optimizations have to go away. So generally, you should only write a depth value yourself if you really need to do it. Also, if your shader writes gl_FragDepth anywhere, it must ensure that it is always written to, no matter what conditional branches your shader uses. The value is not initialized to a default; you either always write to it or never mention “gl_FragDepth” in your fragment shader at all. Obviously, you do not always have to write the same value; you can conditionally write different values. But you cannot write something in one path and not write something in another. Initialize it explicitly with gl_FragCoord.z if you want to do something like that.